Fifty bucks might not sound like a whole lot, but you’d be surprised what you can get for such a small sum of money. We live in a world where you can get a cheeseburger for $1, a functioning computer for $25, and thousands of movies for a mere $10 a month, so it stands to reason that you should be able to pick up some pretty sweet gear for $50. In this article, we’ve rounded up all the best tech under $50 for your perusal. Enjoy! Do you have an older stereo that isn’t compatible with all this newfangled streaming tech? Are you fed up with leaving your phone tethered to an auxiliary port? Not to worry — Chromecast Audio is here to save the day. Just plug it into the aforementioned auxiliary port on your stereo, and connect it to your home Wi-Fi network. Once set up, you’ll be able to sling audio to your speakers using just about any app on your phone. Read more. Looking for a way to dip your toes into the wonderful world of drones, but don’t want to spend a small fortune on an expensive toy you might crash? Check out Hubsan’s x4 Plus Quadcopter. Small in both size and price, this drone is perfect for anyone wanting to break into the UAV scene and learn the basics of piloting a quadcopter. Packing a 1080p HD camera, pre-programed tricks, multiple flight modes, and a huge selection of replacement parts, this little guy will keep you soaring for a long time. Still charging your phone with a cable like a caveman? Get with the times, brother! Snag yourself a Qi wireless charger and you’ll be free from the shackles of cord-carrying life. Put one of these suckers on your bedside table and just plop your phone on it before you go to sleep. When you wake up, you’ll have a fully-juiced phone that you can just grab and slip in your pocket — no unplugging necessary. Seriously, though, wireless charging is one of those little things that makes life slightly easier, and you don’t realize how awesome it is until you don’t have it anymore. In an age of constant change, one thing that hasn’t changed much is the light switch. Belkin, however, is trying to change that with its Wemo Smart Light Switch. Once hooked up, the switch allows you to control your home lighting via a smartphone or tablet. With the ability to set a lighting schedule, Alexa compatibility, and pairing options for most connected home systems, your analog flip switches pale in comparison. Over the past few years, the cost of solar technologies and paneling have dropped to the point where there are now plenty of affordable solar options for those on the go. That said, the ECEEN 13W foldable solar charger is one of our favorite models in existence. The device weighs a mere 9 ounces, and when completely folded, the entire unit measures just an inch thick. There’s a small stand on the backside, too, allowing you to easily prop up and angle the solar charger toward the sun. Now, let’s just pray you don’t encounter cloud cover. The first Pi launched six years ago and the Raspberry Pi 3 Model B+ is faster and more powerful than its predecessors. The Pi is essentially a credit-card-sized PC that sports a quad-core processor, dual-band wireless LAN, and Bluetooth, but you don’t need to be a computer programmer in order to turn the device into a litany of handy (or novelty) gadgets. We’ve even compiled a few projects you make with this Raspberry Pi model right now. The phrase “set and forget” is music to the ears of anyone who wants to make a home-cooked meal with little hassle. 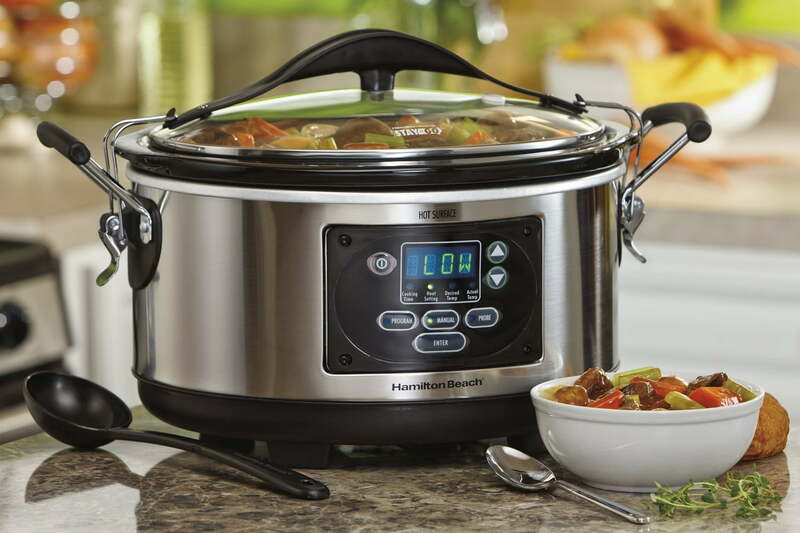 Thankfully, you can program Hamilton Beach’s slow cooker to cook your dish for a specified time, and the device will automatically change the temperature to keep the contents warm once it reaches said time. You can also insert a probe into your dish and set an internal temperature for the slow cooker — the device will automatically keep your food warm when it reaches the designated temp. Cooking gadgets are rarely as easy to operate (or cheap). If there’s one power tool every person should own, it’s a Dremel. It’s basically the Swiss army knife of the power tool world. With the right attachments, these machines can do practically anything — cutting, sanding, polishing, carving, and everything in between. This set comes with a small assortment of attachments to get you started, and if that’s not enough, the tool is compatible with a gazillion more attachments that Dremel makes. Be careful, though. Power tools are a slippery slope, and Dremel is a gateway drug. If you’re not careful, you could wake up a year from now with a table saw and a laser cutter in your garage, wondering where your life went.